1 of 3 Heat 1 tablespoon oil in large saucepan over medium heat. Add garlic; cook, stirring occasionally, 1 minute. Add spinach, 1/4 teaspoon salt, 1/8 teaspoon pepper and the Italian seasoning; cook, stirring, just until spinach is wilted, about 2 minutes. 2 of 3 Remove the spinach mixture to a medium-size bowl; let cool completely. When cool, add the capocollo, provolone cheese and egg; gently stir to combine completely. 3 of 3 Place the pork chops on a flat work surface; cut a slit horizontally to bone so chop can be opened like a book. Stuff each chop with quarter of stuffing. (If freezing, wrap each chop tightly in freezer wrap, without toothpicks; freeze up to 1 month.) Secure chops with toothpicks. 1 of 3 If chops are frozen, thaw in refrigerator overnight. Heat oven to 375 degrees F.
2 of 3 Heat remaining 1 tablespoon oil in large skillet. Add chops; cook 2 minutes per side or until browned. 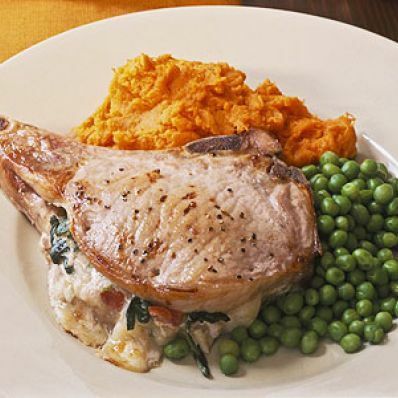 Place chops in single layer in a baking dish just large enough to hold chops. Sprinkle with remaining 1/4 teaspoon salt and 1/8 teaspoon pepper. 3 of 3 Bake the chops in 375 degree F oven for 15 minutes or until the internal temperature registers 155 degrees F on instant-read thermometer when inserted in the pork. Remove chops to a platter; cover with foil. Let stand 5 to 10 minutes in warm place before serving. Makes 4 servings. Per Serving: 1 g fiber, 51 g pro., 569 kcal cal., 1010 mg sodium, 14 g sat. fat, 191 mg chol., 38 g Fat, total, 3 g carb.